I’ve never considered myself a competitive player of any game. Sports were never my thing and I could never shell out the cash for a good card pool in Magic or other collectible card games, which were my thing. So when X-Wing came out I planned to play casually with some friends. There are a couple hitches with that plan. The first is that none of my friends bought into the game with me. The few games I played with them were played entirely with my stuff. My friends weren’t invested in the game and thus weren’t invested in becoming better players. I had to seek out other players who wanted to play the game. The easiest way to do that was to find public events, i.e., local tournaments. The upside to this is that I’ve made friends through the X-Wing community. Rather than using X-Wing as an activity with my existing friends, it turns out X-Wing became a way for me to make new friends. The second hitch in my plan is that the more I played, the better I got. Seems an odd problem, doesn’t it? Since I was was doing well at local events, I found myself wanting to do better at those events and even wanting to see how I’d do at bigger, tougher events. A friend at Adepticon was ribbing me, saying I’ve come so far for someone who “just wants to play casually.” Looking back on things, he’s right. 2014 was a good year for me as an X-Wing player. I’m near the top of my local store’s pool of players and managed to win a couple of small tournaments after GenCon. I took fourth at a store championship in spite of the massive influx of outside players hunting for that regional bye. My showing at Adepticon was certainly respectable, with third and second place finishes. The better I do at tournaments the better I want to do. It’s a vicious cycle. Lately I’ve been spending a lot of time looking at my tournament list and wondering how I can improve it. The analysis of the list is getting ever more sophisticated. What ships give this list a problem? What strategy to I employ against archetypes? What’s the benefit of switching from cannons to engine upgrades? These are questions I find myself asking. I even analyze asteroid placement and how I can construct the field to my advantage. How did I go from a casual hang-out-with-my-friends player to someone seriously deconstructing tournament play? It’s probably Soontir Fel’s fault. Soontir is by far my favorite pilot. He’s got a lot going for him: pilot skill, agility, action bar, attack value, and maneuverability. The pilot skill, action bar, and maneuverability let him dodge enemy arcs with precision no other pilot can match. Over the past sixteen months I’ve learned how to make this ship dance across the mat. The TIE Interceptor may be the most agile ship in the game right now because it has the best action bar in the game, in my opinion. The Interceptor is the only ship to natively have access to the boost and barrel roll actions. Soontir’s unique pilot ability capitalizes on these unique traits because he thrives on stress and the best way to give him stress is to use Push the Limit. 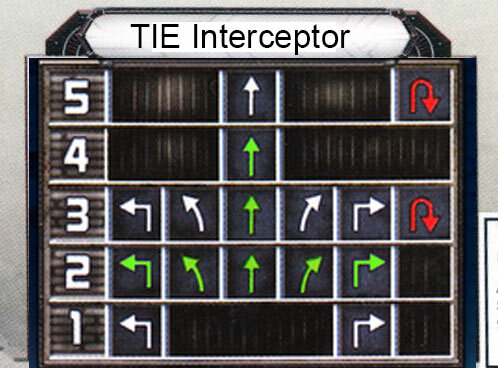 It’s important to understand how actions in X-Wing work. Each pilot is able to perform a single action from the ship’s action bar or from an equipped upgrade. A pilot cannot perform the same action twice in a single round, even if the pilot can perform multiple actions. A pilot with a stress token cannot perform actions or red maneuvers; pilots can clear stress tokens by making green maneuvers. 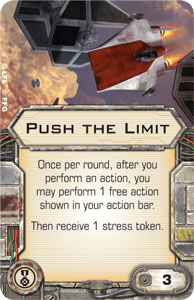 Push the Limit lets a pilot perform two different actions at the cost of a stress token. For a lot of pilots this is a difficult trade off, either locking the pilot into a much more limited (read: predictable) set of maneuvers to clear stress or by not taking actions the next round. Soontir doesn’t worry about this for three reasons. First: he’s getting a bigger benefit out of Push the Limit than almost any other pilot. 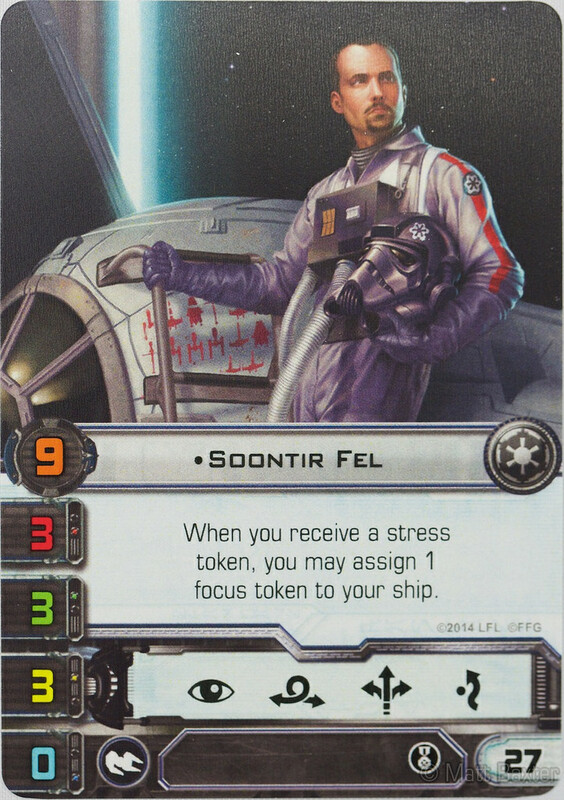 The stress from Push the Limit assigns a focus token to Soontir Fel. He is, in effect, getting the benefit of a third action. Except it’s even better. Since stressing Soontir assigns a focus token, he doesn’t double-dip on the focus action. It’s not unusual to see Soontir sitting on the field with four tokens: two focus, an evade, and a stress. This puts Soontir’s action economy through the roof. Second: the TIE Interceptor dial has a lot of good green maneuvers. All 2-speed maneuvers are green, including the hard turns. The only other ship with a natively green hard turn maneuver is the A-Wing. Having the 3- and 4-straight maneuvers is also clutch. It’s easy and hardly limiting to use green maneuvers in an Interceptor. The only other ships with comparable dials are the A-Wing (which is the same except the 5-straight is green) and the recently released Aggressor (which has a whopping nine green maneuvers: the straight and both banks in speeds 1 through 3). Third: Soontir with Push the Limit can boost and barrel roll every turn. Not boost or barrel roll like other ships. Boost and barrel roll. The ability to move three times every turn and still have a focus token is incredibly powerful. All of this together means that Soontir is perhaps the best end-game pilot you can have. His action economy and maneuverability make it nigh-impossible for an enemy ship to get him in arc if there are only two ships left. As good as Soontir is, he’s incredibly fragile with only 3 hull and no shields. Equipping him with the Stealth Device was popular a while back. A ship that rolls 4 agility dice when defending can be very sturdy. 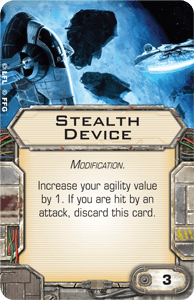 The problem is, the dice are weighted toward offense in X-Wing and more often than not the Stealth Device would only be good for a single attack. Rather than trying to increase Soontir’s evasion, some people preferred to increase his durability by adding a shield or increasing his hull. Neither was particularly effective. When Imperial Aces came out, there were a few interesting new options for Soontir. 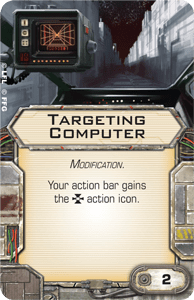 My favorite was the Targeting Computer, a card that added the one missing item to the Interceptor’s dial: target lock. Soontir could reliably generate a target lock, evade, and focus token each turn when he wasn’t repositioning. This really increased his hitting power and stepped him up to apex predator status. Soontir with a Targeting Computer and Push the Limit flew me to a tournament championship with a pair of Bounty Hunter Firesprays backing him up. 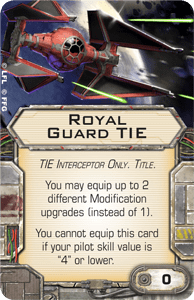 The most key item from Imperial Aces, though, is the Royal Guard TIE title. It allows a TIE Interceptor the unique ability to equip two modifications – as long as they aren’t the same modification. 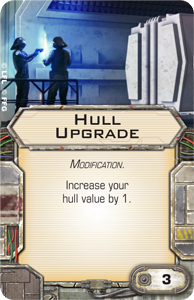 There have been a lot of combinations thrown out there, from Hull Upgrade and Shield Upgrade to Targeting Computer and Stealth Device. They were fun but none of the options were cost efficient. The recent release of the Scum & Villainy faction for X-Wing has shaken up the game quite a bit. Lots of players are trying the new ships and pilots and exploring the new things available. Others have integrated the new upgrades into existing Rebel and Imperial lists. 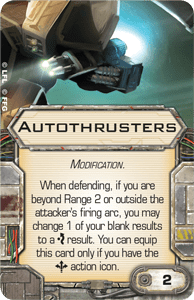 The card that’s made the biggest splash on the Imperial side is Autothrusters. It’s a modification that can only be equipped by a ship with the boost action. Currently there are only four ships that can equip Autothrusters: the A-Wing, TIE Interceptor, StarViper, and Aggressor. 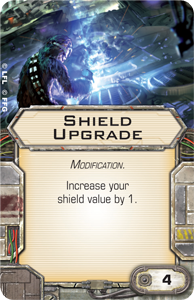 When Imperial Aces was released last year, a lot of people quickly gravitated toward a new ur-Soontir that costs 35 points: Soontir Fel, Push the Limit, Royal Guard TIE, Autothrusters, and Stealth Device. This has proven devastatingly effective in the current tournament landscape. The big turrets ruled the roost after GenCon last year as everyone struggled to find a way to counter the elite TIE Phantoms. Putting Autothrusters and a Stealth Device on our standard PtL Soontir means that turrets have a hard time touching him. 2-dice attacks have always struggled to hit Soontir and the extra agility die helps with range 1 attacks. With a focus and evade token, the worst result Soontir can have against an out-of-arc turret is two evades. That’s if he blanks four defense dice. This means a turret that rolls 3 hits has a less than 2% chance of connecting. Soontir is a dodging machine but it means he wants to stick to range 3 or out of arc – arguably things he’s always wanted. This is incredibly powerful largely because it takes the dice out of the equation, the way the C-3PO crew card makes the Falcon so hard to take down. As powerful as Soontir is, he’s not invincible. There are a number of hard counters to him. The hardest counters are dice he cannot defend against. Here are the ways to kill my Soontir if you find yourself flying against me. The Darth Vader crew card, especially on a Decimator, is a great example. Guaranteed critical hits are very powerful. The only way to defend against this is to dodge arc (if possible) and take out the enemy before they can focus down Soontir. It’s important to note that the critical from Darth Vader will not get rid of Soontir’s Stealth Device because it’s not part of the attack. The Autoblaster cannon and Autoblaster Turret are range 1 attacks whose regular hits cannot be canceled by defense dice. This isn’t too much of a worry, staying out of range 1 should be easy most of the time… except Kavil and Boba Fett can each take a form of autoblaster and move after Soontwir. Keeping an initiative bid in my list is important here for defending against Kavil but the real key will be using the Interceptor’s superior action bar to outmaneuver Kavil by barrel-rolling and boosting If Soontir gets in behind Kavil, there’s nothing the Y-Wing can do to shake him. Excellent maneuvering is important with Boba Fett, using the Firespray’s larger base against it becomes the key to success. Ten Numb has the special ability that one critical hit on her dice cannot be canceled by defense dice – this means that if Ten runs a “Mangler” Cannon and rolls at least one hit there is nothing Soontir can do to dodge it. Bad news. Thankfully Ten is in a B-Wing and dodging arc is fairly easy. The bad news is she’s pilot skill 8 and can take Veteran Instincts to move after Soontir. Ten does turn off the Stealth Device. If anyone actually flies him and he actually gets a shot off, Lieutenant Blount would turn off the Stealth Device on Soontir. He wouldn’t do any damage but he would get rid of the defense bump. I don’t count it as likely, though. The various 4-dice attacks are more of a threat at ranges 1-2 but at range 3 the Heavy Laser Cannon isn’t much of a worry because Autothrusters kicks back in. Once an attacker starts building up into 5-dice attacks things get hairy. There are only a few times this might happen: a 3-attack ship uses Expose at range 1 (or with a Heavy Laser Cannon at greater range), Kath Scarlet fires out her rear arc at range 1, or if the opponent is fielding the Rebel Jan Ors HWK-290. This usually means range 1 where Soontir only has four dice and his Autothrusters only work out of arc. If five hits get through, it’s almost assuredly doom for Soontir. The solution here is, as always, careful flying and avoiding range 1 if at all possible. Multiple attacks do have the potential to whittle down Soontir into just dice but that’s really hard to do. It would likely take two attacks at range 3 with three hits to strip Soontir of tokens before a third attack could punch through. Focus fire of that magnitude is incredibly hard to manage. Anyway, that’s my love fest for Soontir Fel in X-Wing. If people like this, I’ll write up some article about other pilots in the game. This entry was posted in Blog, X-Wing. Bookmark the permalink.